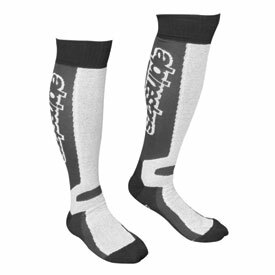 The Alpinestars Thermal Tech Socks are designed specifically for riding using a warming, breathable and moisture wicking knit fabric to provide comfort inside Alpinestars motorcycle boots. The sole of the Alpinestars Thermal Tech Sock is combined with Nostatex fibers to provide antibacterial properties and to dissipate heat evenly throughout the sole to provide overall comfort. Warm, breathable moisture-wicking knit fabric. Nostatex®, silver yarn sole for wicking moisture away from the skin and giving an anti-bacterial, non-odor layer that conducts heat uniformly around the skin surface to reduce hot spots. Knee length design for coverage and comfort. Good solid pair of socks. I wear these with a set of Gore-tex boots, and since my boots are armored, I have encountered breathability issues as compared to previous Gore-tex boots I have owned. The socks ride high on my lower leg and come well up over the calf. They have no problem staying up (doesn't overstretch and fall down), which helps to prevent my boots from getting clammy. Socks are definitely warm in the cold weather. I ride with calf height boots and these socks provide plenty of warmth. Only issue I have seen with these socks are the threads on the sock itself tend to come apart. Not sure if anyone else has seen this. But otherwise they definitely do the job that they were intended. Slightly warmer than my normal MX socks in cold weather. Not quite convinced they're worth the price. We'll see once I hit some water. Great socks! They don't streth out during wear. Great fit, keeps you cool in Summer and warm in Winter. Fit and quality is good. Would buy again.